It used to be easy to review John Williams scores - great main theme(s) and stunning/excellent/good everything else. Now it's not so easy and War of the Worlds is one of the most challenging Williams scores in some while. If Minority Report was difficult to assess due to being rather uneven, War of the Worlds is just a difficult listen and those feeling cast adrift will likely home in on the portions that sound like other scores - Minority Report in sound world, a few Sith chord progressions, hints of Nixon in its bass drenched tones - which is not suggest it's not original, simply that the relief from the darkness or the expected breakout into the big theme never comes. Sure, there are some pretty fine action sequences; The Ferry Scene, The Attack on the Car and parts of The Confrontation with Ogilvy and Escape from the Basket all have their moments, with concise, crisp orchestration, together with crystalline engineering that results in a cleaner, rather steely sound, making the despair even more stark than the relatively lush Revenge of the Sith. That War of the Worlds doesn't have an obvious stand out track (not that this is a requisite, but I can't think of a single Williams score - since Jaws, at least - that doesn't have at least one really memorable cue) is a strike against instant likeability. It is also lacking a strong main theme. True, Minority Report hardly leaves you humming, but plenty of incidental motifs keeps most tracks fresh. That there is no 'this is clearly the main theme' track here is quite telling. Yes, there are incidental motifs, largely during the tracks that are neither action nor tension building - Ray and Rachel and Refugee Status are both relatively hopeful and a lovely oases - but they don't linger in the brain for long. 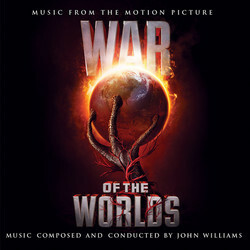 It seems like a fatal strike against a score to say that it's the atmosphere that is most memorable, but for War of the Worlds, that is very much the case; the brooding, intensely claustrophobic suspense for cues such as Probing the Basement, and the earlier parts of The Confrontation with Ogilvy harks back to the creepiest moments of (appropriately enough) Close Encounters of the Third Kind, but with the tension both greater and more sustained and without the promise of a spectacularly optimistic, melodic finale. Both the Prologue and The Reunion contain the voice over of Morgan Freeman, but his grave tones work well (even if The Reunion gives away the ending) against the musical angst. Yes, even The Reunion resolutely avoids lightness and the Epilogue is closer in spirit to Sith's Immolation cue in its tragedy. One almost wonders whether Williams has gone too far - Schindler's List has a more uplifting finale than this. It seems surprising for a Spielberg/Williams collaboration to so unashamedly avoid crowd pleasing and really go for the tension and tragedy, shutting out the light almost entirely. The action follows the stylistic pattern of Williams' recent outings, but its dissonance, intensity and complexity is a refreshing twist on its any similarities to other recent works. It both harks back to very early Williams works (his Essay for Strings) and the recent (the werewolf music from the last Harry Potter) and shows what could be deemed a more mature side to the composer, unafraid to move away from the tuneful musical territory that made him famous and into the more astringent side that he so usually only explores in his concert works or, briefly and infrequently, his film scores. Those (like me) who occasionally revel in hair raising, challenging sound worlds, will find much to relish here - it's certainly a score that needs repeat listens to pick up on the nuances. One listen is entirely insufficient and will almost certainly result in disappointment to the average Williams devotee, but try it again and each listen reveals Williams typically staggering way with the orchestra. Maybe the comparison to his Essay for Strings is apt - to some, parts may feel like an extensive exercise in orchestration and dissonance, but with a more complex palette and several decades more experience. However, that does not mean it should be dismissed and there is, I would venture, far more to be gained from extended acquaintance than his far easier score to The Terminal (for example) whose frothiness will eventually pall. War of the Worlds is unlikely to be a first choice while browsing one's Williams collection, but it demonstrates a composer still at the top of his game and of stupendous technical facility. Steven Spielberg's version of H.G. Wells' classic novel from 1898, is a more human and personal re-telling of the familiar and often re-visited story of aliens attacking our planet, with Tom Cruise as the main protagonist. John Williams' score - his 21st score for a Spielberg film - is a tough listen, dominated by dissonant and atonal cues. It's a somewhat unusual road to take for Williams, who really hasn't written a score this dissonant and dark since Close Encounters of the Third Kind. Williams bases the score on syncopated rythms and pulsating ostinatos, with orchestrations dominated by low brass and percussion, with strings and woodwinds usually placed in the background. This is not a score that will knock you off your feet with its strong, memorable Williams themes. Far from it. But chances are it will knock your socks off with its sheer energy and power. The percussion section seems larger than is usually the case, with thundering and pounding timpanis enveloping the listener from all flanks, as well as dark and gritty brass punches. Make no mistake about it, War of the Worlds is a pure horror and action score, filled with agressive and creepy music. The orchestrations are excellent. Williams utilizes every part of the orchestra to the max, and skillfully plays them off of eachother in a very impressive way. It's complex and it's playful. The action music, such as the excellent "The Ferry Scene", draws from, and expands on, ideas and sounds found in scores such as Minority Report and Jurassic Park: The Lost World, without ever mimicking them. But it's a though listen, with Williams' dissonant and atonal soundscapes simply demanding too much of the listener at times. Overall, the score is a little too long and a little too similar to be able to hold your attention for longer periods of time, even if a couple of more quiet cues offer some variety and chances to catch your breath. Cues with narration, or sound clips taken from the film in question is usually not a good idea. On the War of the Worlds soundtrack, narration by Morgan Freeman can be found in two of the tracks - the opening "Prologue" and the penultimate "The Reunion". I'm not a big fan of these kind of things, but here it actually works. Freeman has a great voice, after all and his opening and closing monologues create a very dramatic mood, together with Williams' underscore.